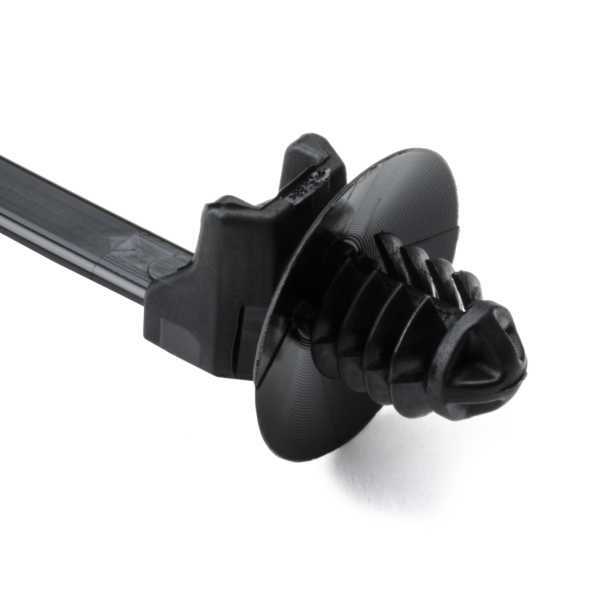 • Fir Tree Push Mount offers simple and easy to use method of bundling and fixing cable ties. • The design of the fir tree ensures a positive secure fixing into panels with thicknesses from 0.6mm to 4.2mm or threaded blind holes. • Fir Tree Push Mount offers simple and easy to use method of bundling and fixing cable ties. • The design of the fir tree ensures a positive secure fixing into panels with thicknesses from 0.6mm to 4.2mm or threaded blind holes. • The 'disc' on the top of the fir tree covers the hole and minimizes the ingress of water and dirt. Fir Tree Push Tie designed for fixing cable harnesses. Their simplicity and ease of use make them an option for anywhere where secure and easy installation are needed.